Wherever you are or have been on your spiritual journey, you are welcome here. 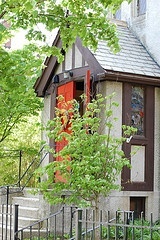 Church of Our Saviour is a diverse and vibrant Christian community in the Episcopal tradition. We believe in caring for each other, serving the wider community, and being good stewards of the earth. Whoever you are or whoever you’ve been, we warmly invite you to join us for Sunday worship and fellowship time to truly experience the way God is present here. Our Eucharist, which means “Thanksgiving,” is a service of Holy Communion open to all. Each Sunday, we gather in a circle to hear God’s word and pray. Learn here about our services and programs, activities for children, and efforts to reach out to others. Then come and see, introduce yourself to our rector Rev. Malia Crawford or deacon Rev. Sue Fisher Seeger, say hello to the greeter as you come in, and if you like, fill out a newcomer card found in the pew. Palm Sunday, Apr. 14, 10 a.m. Process with a live donkey down Mass Ave. as you wave palm branches. Then return to BIG CHURCH for the story of Jesus’ journey to the cross. Maundy Thursday, Apr. 18, 7:30 p.m.
Worship, join in foot-washing (optional; wear easy-to-remove footwear), and stay for the ritual stripping of the altar. Open meditation period to follow until 9:30 p.m.
Easter Vigil, Apr. 20, 8 p.m.
Fire! Chanting! Resurrected life! The most amazing worship service of the year. Bring bells or noise makers–and a plate of goodies to share afterward.